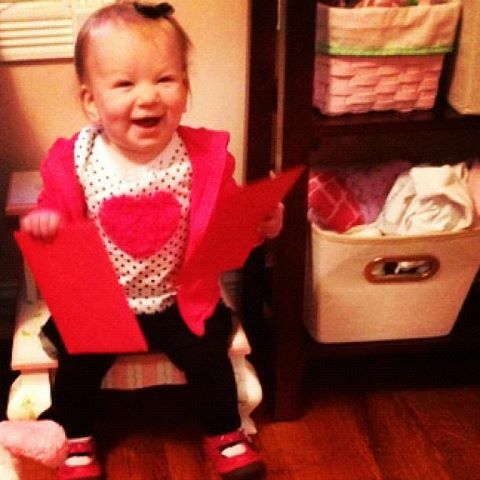 My little Valentine wants to say hello. She was so ridiculously happy today and we felt awful bringing her to meet the surgeon who will be doing her tubes procedure sometime next month. Anyway, I took a half day from work, had lunch with a friend (hubby couldn’t leave work today at lunch since we had to go to the doctor in the afternoon) and then we met up at the hospital. So we’re set for tubes now … it isn’t a guarantee she won’t have any more ear infections, but the likelihood is much less once she has them put in and she can still go to swimming class — which is a bonus :). So we will see how it goes. Obviously I’m nervous, but everyone says it’s no big deal so just please keep us in your thoughts when the time comes! After the appointment, we went home (hubby had to go back to work) and played. It’s amazing how much happier I was after getting home around 3 with her … I even had time to make a lovely family dinner! (a grocery-store-bought rotisserie chicken can truly set the stage for an easy meal). I coupled the chicken with herbed [rosemary-thyme-garlic-parmesan] roasted potatoes and roasted asparagus and we shared the delicious cupcake L brought me for dessert our usual way — most of the frosting for me, most of the cake part for L and baby got in on the action, too. It was so nice to sit down at the table, all together — a rarity on a week night for us! Even Rocco enjoyed some of our dinner 😉 All in all, a great family day with the people I love the most. And now we will be doing something for the littlest valentine we love the most … hopefully easing her chronic ear pain and discomfort by getting tubes. Eeks! I hope you had a wonderful Valentine’s Day with family and friends. How about you? Did you or your kids have tubes? Any advice for us? That’s so good to hear, Candice — and yea, that part is going to be weird. Thank you!